Click the arrow next to any week below to jump the the Trip Log for that week. 15-Sep-09 :: Arriving at Narita should have been familiar, but was not really. Although the airport looked much the same, the layout did not ring any bells. We opted to take the Narita Express into the city, as the Four Seasons is a short walk away. Our first train journey in Japan was as smooth as I remembered, and helped increase our anticipation for future trips on the shinkansen. I surprised myself by remembering enough Japanese to purchase a phone card from the lady pushing around the refreshment cart on the train, and rang the hotel to let them know our arrival time. The staff from the Four Seasons were there to meet us as the train pulled in, and helped us cart our luggage to the hotel. We arrived to the usual spacious rooms of the Four Seasons, and unpacked before we started to think about dinner. When the time came, an Indian meal at Moti was the unanimous choice. I wasn't sure if I remembered the exact location, so we double-checked with the concierge about the details and then we were off to the nearest subway station on the Ginza line, with a transfer to the Chiyoda line  very familiar! When we exited Akasaka Station, there was Moti, upstairs and just to the right. I asked one of the staff what had happened to Girish, who was one of the owners of the chain and always at that branch in the evening  he informed me that Girish had opened his own Indian restaurant in Dubai! But the food was quick and tasty, just as remembered. The next morning we ordered room service for breakfast, which convinced us that a visit to Kinokuniya (international supermarket) in Omotesando was in order, to purchase some cereal and milk. First, though, Daniel got the kids excited about a visit to the Sony Building, just up the road in Ginza. We set off with lots of energy, only to discover that we were there too early! But some other shops were already open (this was at 10:30am) so we passed our time in the Apple store, playing with the iphones and ipods. Then we returned to the Sony store and walked around to see all the new products on offer  some pretty cool stuff! We also checked out the televisions, in case one of them might be suitable for our needs in Vermont. Then it was back on the subway for a visit to Shibuya. The kids caught on to the method for buying subway tickets pretty quickly and all wanted to have a chance to push the buttons and put in the money, so that kept everyone interested in going up and down the stairs. Upon reaching Shibuya (on a Thursday, no less), I was surprised by the crowds. Other than Hachiko (a statue of a dog which is a popular meeting place), not much looked familiar to me. Daniel seemed to remember his way around, so we just followed him. We never did find the games arcade that he recalled, but we set off for Omotesando instead. After awhile we became unsure that we were going the right way and tired of listening to the kids complain, so we hopped into 2 taxis bound for the supermarket. We found plenty of Weatabix, so everyone was happy. They were also selling green grapes for about $15 for a small bunch, so I bought those (and was later dismayed to discover that they contained seeds). A few boxes of saltines and Ritz rounded out our purchases, and we returned to the hotel. That evening we set off again on the subway, with the idea of having dinner at the Hard Rock Café in Roppongi. Surprisingly, when we arrived we were told that it would be a 30 minute wait for a table in the non-smoking area! Having decided that the smoking section was not really an option, and that it was not really appropriate to wait in the bar with the kids, we looked for an alternative nearby. Fortunately, Roppongi has added a TGIF so we were able to get a table there. Not the most inspiring food, but everyone was satisfied. Friday we ended up staying in the room most of the morning because I decided that we needed to get busy booking the rest of our stay in Japan. Making last-minute reservations has worked for us for the past year, so it was a bit of a shock to find places that we want to stay were full. I was also annoyed with myself for not researching when the national holidays fall  it turns out that this year 2 holidays fall very close to each other and everyone is turning it into a 5-day weekend, which has made it very difficult for us. Had I known, I could have planned to spend those nights in Tokyo, since no Japanese people want to spend their national holiday there! But we just had to make adjustments, so after several hours of research and internet booking, we came up with an itinerary that took us south first (even though it's still pretty hot) and later back up to the Japanese Alps. By 2pm we had confirmation for almost everything and decided to pop down to Tokyo Station and purchase our shinkansen tickets. The concierge from the hotel kindly offered to take us in order to translate and make certain that we purchased the proper tickets, so about an hour later (and after a few obstacles  apparently, foreign credit cards cannot be charged more than $200 in one transaction, so we had to divide the tickets into several), we returned to the hotel with those in hand. 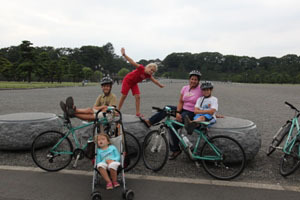 After that we headed out, 3 of us on bicycles and the rest on foot, to the Imperial Palace, by the famous bridge. That took us about an hour, during which we attempted to visit the Palace Hotel and discovered that it has been demolished! Daniel was most upset, since he used to have his hair cut there and take business associates for drinks there. It even continues to appear on maps, but I spoke briefly to the construction crew there, who insisted that it had been knocked down 2 years ago. After that we returned to the Four Seasons and headed down into Tokyo Station to a casual sushi restaurant the staff had recommended. Once everyone had their fill of sushi an sashimi, we went back up to the room to get everyone settled before Daniel and I headed out to Roppongi to explore some of our old hangouts. Daniel was most dismayed that I went the wrong way to Mogambo's, a small bar where we used to meet up with friends. After a drink there, and another one at Motown, we walked down the road in search of Sunset Strip. Not only was it gone (not surprisingly  it was a dump when we went there 15 years ago!) but we couldn't even figure out which shop or building might have replaced it. From there we explored the new Roppongi Hills development and decided to return with the kids. And we ended with a drink at the bar of the Hard Rock Café before returning to the hotel before midnight! He next day we dragged the kids off to Roppongi Hills, where we visited the small aquarium and took in the views from the rooftop and viewing platform. After picking up snacks at Starbucks, we added to our cereal stash at Meidi-ya, the international supermarket nearby. From there we headed back to the hotel for a quick workout and a visit to the sauna and spa bath. Having asked the concierge to find a teppanyaki restaurant, we got dressed up and waited to find out where we would be going. After our reservation at the Barney's restaurant was confirmed, we hopped into 2 taxis to head down the road to Ginza. The meal was amazing  of course it was incredibly expensive, but the teppanyaki steak was out of this world! The meat literally melted in our mouths, and we ended up ordering more. After a very satisfying meal, we returned to our hotel for bed. Sunday morning we arose early and packed up to catch our train to Hiroshima. Click on any picture below to launch a gallery of pics from Tokyo. Or check out some more pics at Flickr. 11-Sep-09 :: Our flight landed on Guam at the unsociable hour of 4:35am Thursday, but Peter was there to meet us  now THAT is a friend! I had suggested that we catch a taxi, but he pointed out that a taxi driver would be unlikely to find their house and it would be easier for him to pick us up. So we reached his house at about 6:00AM on Thursday, where his wife Joan was up and getting ready for work. Their younger son, Nicholas, was still asleep but woke up shortly after and headed off to high school (their elder son, Peter, is away at Marquette University). They were such amazing hosts, really going out of their way to make sure that we would be comfortable. The kids took one look at the Wii and Xbox 360 and proclaimed Peter and Joan's house the best place we had ever stayed! That day we were quite happy to just nap and relax in the house to recover from our short night, and for dinner we were treated to Joan's delicious, homemade spaghetti sauce. We also met Karen, a family friend who often joins them for dinner. August is the rainy season in Guam, so we certainly saw lots of rain! Still, we managed to sneak out for lunch during a dry spell on Friday and have some amazing sushi, and later that evening we braved the downpour to have Chinese food and go to the house of a friend of Peter and Joan's for a few drinks afterward. Saturday Peter had to attend a meeting for the board of Nick's school, so we didn't see much of him. Joan and I went out for a spa treatment in the morning, while Daniel caught up on some e-mails and the kids entertained themselves in the house. Then we all went bowling at a huge resort complex with the 32 lanes! The kids always enjoy bowling on a rainy day. By the time we reached the house again, it was time to pack for our trip to Yap and Palau, then have a quick meal before returning to the airport. The flight to Yap was pretty uneventful, until the landing  no sleeping through that! Apparently the runway is quite short so planes have to touch down and put on the reverse thrusters immediately in order not to overrun it. Yap is a rather unique place. Our main goal in visiting was to see manta rays while diving (sound familiar?  this was the same motivation for visiting another island in Australia, Lady Elliot!). So our first instinct was to stay at the Manta Ray Bay Resort in Colonia, but Daniel decided that it was too much of a "divers" place and picked nicer accommodation. It's true that the rooms were very comfortable at the Traders Ridge Resort, also in Colonia, and the girls enjoyed spending the day there while the rest of us went diving. But the food was pretty awful and we ended up eating most of our meals at the Manta Ray Bay Resort because they had this unique restaurant on a triple decker boat attached to the dock. For a 5-minute walk we were treated to delicious pizza and homemade beer. I participated in the first day of diving  basically 2 hours spent waiting on the sandy bottom of the channel, waiting for some manta rays to come to the "cleaning station", which is where little fish called wrasses "clean" them by eating stuff off their bodies. Frustratingly, no mantas turned up, though we did spot 2 black-tipped sharks and one white-tip, as well as a couple of moray eels. So the second day I decided to pass and stay back at the hotel with the girls. Meanwhile, Daniel and the boys spent another 2 hours hovering on the ocean floor, but still didn't see any manta rays. How disappointing! We returned to the Manta Ray Bay restaurant again for some more of their addictive pizza for dinner. On our last day in Yap we couldn't dive because of the requirement to leave 24 hours between diving and flying, so we had to find something else to do. Budget Rent-A-Car had a Nissan Sentra for us to rent for the day for $50, so we decided to go ahead. We had a little adventure driving around the small island (it's only slightly bigger than Bermuda), and finding the Village View Resort, located at the north end of the island. On our first attempt we managed to drive around in a big circle, but on the second attempt we found the place and were relieved that the restaurant was open and serving lunch, as we were all very hungry. After eating, the plan was to snorkel a bit off the beach, but rain showers kept coming in off the water, so Daniel and I lost interest. The kids were still keen, so they played on the beach for awhile, but when their behavior started to deteriorate we had to round them up, shower them off, and get them back in the car. When we reached our hotel, there was still a bit of time to kill before dinner, so Ben and I walked 20-minutes in the heat to the famous stone money bank  in reality, just a building surrounded by large round stones with holes in the middle. We then packed up our stuff and loaded the car to go back to the Manta Ray Bay restaurant for yet another pizza dinner and were stunned to learn that the divers had seen 8 manta rays that day! The boys were really feeling unlucky after that discovery, and found it quite depressing to watch the slideshow of the photos taken by the divers. After dinner we drove to the airport to check in for our 10pm flight to Palau  another uneventful flight, followed by a jolting landing. We reached our room at the Pacific Palau Resort around 11:15pm (which was like 12:15am because the time changes by 1 hour), so we were all exhausted. The next morning we were happy to sleep in and have a late breakfast. Once we made our arrangements for scuba diving on Thursday and a babysitter for the girls, then we were able to relax and enjoy the beach and pool at the resort. The snorkeling just off the beach was really good, so we spent an hour in the morning out there, then played in the sand for awhile. In the afternoon, Daniel and I each had a massage  our first one in over a month! Then I took the kids back out to snorkel, and we followed a turtle for awhile. After everyone showered and changed, we headed into town for dinner at the Taj restaurant, recommended by Peter and Joan. The food was delicious and we all ate way too much, probably because it was our first Indian meal since June, in Siem Reap! The next morning we were all at breakfast by 7:30am, then met the babysitter, Jadie, in the lobby at 8am. After showing her the room and discussing what the girls could get up to during the day, Daniel and I took the boys out to the jetty to wait for the dive boat to pick us up. The water was a bit rough on our side of the island, so the dive shop ended up sending a van to collect us instead. After filling in the usual paperwork, we met our dive master, a fellow called Jade, and the resident videographer, Nick. Daniel had just been talking about how nice it would be to get some decent photos of us diving, so his wish was granted  Nick filmed us all day long and we can purchase the disc! Our first dive site was another channel with a cleaning station, where we hoped to see some manta rays. Again, no luck, but we swam off after awhile and saw a bull ray lazing about in the sand, and had a close encounter with a couple of turtles. After surfacing, we zoomed off to an island for a picnic lunch and a rest, then continued to our second dive site, which was a lovely coral wall. We spotted a couple of black-tipped sharks there and lots of small stuff, plus the coral was quite beautiful. From there we proceeded to the famous jellyfish lake (recently featured in Time Magazine) where the jellyfish have lost the need to sting because they have no predators. The water is not quite fresh (it's brackish) but the lake was formed when the sea levels dropped 10,000 years ago or so and we swam with hundreds of brown jellyfish  it was very peaceful. After hiking over the hill and back to the jetty, we boarded our boat for one more stop  black tip city. We had a quick snorkel with 2 sharks then returned to Sam's Tours. I couldn't believe it was nearly 6pm! After calling the babysitter to assure here that we'd be back soon, we watched a bit of the video footage that Nick had taken throughout the day. Daniel will edit the DVD into something shorter  maybe about 10 minutes  and add a link to the web-site soon. For our final day we'd arranged a kayak tour, with a 7:45am pick-up. We woke up at 6:30am to a very overcast day, which quickly deteriorated into horizontal rain. After cancelling the kayak trip, we started wondering how to pass the day. No matter what, it was bound to be painful since our flight departed from Palau to Guam at 2:30am. We ended up passing the day in the room, with Daniel and the kids napping. However, I definitely see a return trip to Palau in our future! Once again Peter and Joan were there to pick us up at the Guam airport at 6:00AM Saturday, and the kids were very excited to get back to their house and dig into the shopping bag of all their favorite cereals. In honor of Karen's friend's birthday, about 6 extra people were expected for dinner, so Miranda went along to assist with the shopping and Felix got to work in the kitchen helping out. The weather was much nicer this time  mostly sunny with a few clouds floating overhead  so we spent a lot of time outdoors, especially at mealtimes. There was some talk of tennis on Sunday morning, but after a late night nobody was up in time to beat the heat. So Sunday was spent mostly around the swimming pool, since some more friends with kids came over to play. Joan went all out at lunch, boiling some bratwurst in beer and onions, then getting Peter to BBQ them. What a treat for a girl from Wisconsin! And I put together a small potato salad as part of the dinner set up  another BBQ with steak and burgers. Suddenly the weekend was over. Monday at lunchtime Peter came home from work and took us to the sushi restaurant for lunch again, which the kids loved. Then Joan had made a hair appointment for me at the Hilton, where the view of the beach is gorgeous. Joan made her special spaghetti sauce again and we all enjoyed the pasta and salad for dinner. Keeping the kids from spending their entire day on the Wii and Xbox was a challenge, but Daniel managed to get them to do a bit of studying while I was at the hair dresser. Tuesday was our final day, so Peter stayed home and took us on a drive around the island, all the way to the south tip where the views are amazing. Peter is very knowledgeable about the different areas of the island and we got lots of information from him. The boys also got lots of photos, and we ended up meeting Karen and Joan at Mexican restaurant for an early lunch. After that the kids and I returned to the house to pack and get in a bit more studying, while Daniel went off with Peter to see the north of Guam (where the air force bases are located) and shop for a new pair of jeans. Our final dinner with the Gills involved eating up all the leftovers from all the fantastic meals we'd enjoyed over the previous few days, which was very satisfying. That evening the weather reverted back to the rain we had encountered the previous week and Wednesday morning as we finished packing up and headed off to the airport it was raining cats and dogs, which made it difficult to stay dry! Checking in to our flight for Tokyo was very straight-forward and we looked forward to landing in Narita again after 15 years! Click on any picture below to launch a gallery of pics from Guam, Yap and Palau. 05-Sep-09 :: It was hard to leave our wonderful hosts in Guam (Peter, Joan and Karen) but have arrived in Japan and looking forward to 4 weeks touring. Already re-acquainted ourselves with Moti (Moni's favorite Indian Restaurant), Motown Bar and a visit to Tsukiji. 05-Sep-09 :: Check back soon for a new Family Blog entry. In the meantime, please click on any picture below to launch a gallery of pics from Guam, Yap and Palau. 01-Sep-09 :: Back at our temporary home, we went back to the supermarket and stocked up on food for the week, then returned to the cycle rental shop to recover our bikes. And so we started another week of hard studying (this time I asked the kids to be a bit more choosy about which TV programs they watched), visits to the beach, bike rides and tennis. We also made good use of the swimming pool and hot tub. One evening we took advantage of the local fresh fish shop and baked some salmon for dinner. And we even went out one evening, to On the Inlet, the restaurant at the marina, where the big attraction is George the Giant Grouper  he is fed a large tuna each day at 5pm, while being watched by crowds of people. But by the end of the week we were ready for some more action. As a reward for all their hard work, I took the boys on a kayak trip to Double Island, near Palm Cove, and Daniel took the girls to a nearby pony farm for a horse riding lesson. Then we packed up to leave the house for a more active 4 nights before leaving Australia. Our first stop was Kuranda, a very touristy little town in the rainforest. I came here 17 years ago to bungy jump from a crane, but could find no evidence of the A.J. Hackett set up. In fact, I couldn't get my bearings at all, which was kind of unsettling. But we found a parking spot near the historical market, as it's called, and because we hadn't recently done anything like it, we bought the "3 park pass" for the bird park, butterfly park and koala park. Each was about a 30-minute visit, so a little over-priced, but the kids did get a lot of pleasure out of the visits. We noticed that the town seems to shut down by 3:30 - 4:00pm, since that is when the day visitors leave to return to Cairns. That evening we stayed in the rooms attached to the local pub, a very different experience to our lovely house in Port Douglas, but quite comfortable. Benjamin and I went for a walk alongside the river at sunset, before returning to the pub to gather the rest of the family to walk up the road to frogs, where we had booked dinner. The restaurant was surprisingly full of activity, given how quiet the town was, and we were treated to some delicious hamburgers and nachos. Sunday morning we were up and out pretty early, eating breakfast in the room in anticipation of a visit to the playground and the butterfly sanctuary. By the time we drove out of town, heading for the Baron Falls, it didn't even seem like the same place I had visited 17 years ago! After Baron Falls, we stopped off at Davies Creek and falls, which was really lovely. It was quite a long walk down to the lookout point, and then across to a swimming hole, but the kids really enjoyed the experience. When we finally managed to drag them out of the freezing water it was already early afternoon. From there we stopped off at Super IGA to get the essentials for a BBQ that night and headed to our campsite in the Mareeba Wetlands. When we arrived it was nearly time for a boat tour of the wetlands, so we hopped straight on board and then were shown our campsite later. The cabins were pretty nice, with metal frames and canvas covers, and the most luxurious aspect of all  indoor toilets and showers! Maybe I can't really call it camping ... After taking lots of photographs of the sunset, we set to work grilling our hamburgers and sausages, which was lots of fun. Once darkness set in, there seemed little point in staying up, so we all headed to bed early. Next morning I awoke at dawn, got dressed, and woke up the boys to go canoeing. The temperature before the sunrise was seriously low, so I was glad to have my warm hiking jacket on. We paddled around quietly, observing the little birds hopping on the lily pads, the swans paddling serenely around the lake and the shy ducks which flew off if we got too close  the boys got some amazing photos. By 7:30am we were back at the information center and the air had warmed considerably. We headed back to the cabins for cereal and then met Chook (the resident guide) for a drive in the jeep to another nearby inlet, which was home to more water birds. By the time we returned from that outing the weather had turned positively beautiful, and we were psyched for another day of driving around the picturesque countryside! Our first stop in the Atherton Tablelands, the area with the highest altitude in Queensland, was the main town of Atherton itself, which was very cute. After a picnic in one of the parks, we continued on to Hasties Swamp, which has a huge bird hide for watching hundreds of whistling plume ducks. From there we proceeded to Woolworths supermarket to stock up on ingredients for 2 dinners, and then drove down to Tarzali to find our accommodation. All the towns in the Atherton region are very cute and have maintained some sort of traditional appearance, including Malanda, a town with a waterfall on the way to Tarzali. We stopped to have a look, but maintenance had forced the closure of the viewing platform and there was no real place from which to take a photograph, so we carried on. Our accommodation was part of the Canopy Treehouse Resort, so we first visited the office and got some information about the 100 acre property full of wildlife. Then David, the manager, showed us to our house, a lovely little A-frame in the forest. After unpacking, the first thing the kids wanted to do was to walk back to the office, where David had mentioned they feed wallabies and possums each evening. So we grabbed a torch and set off through the forest, which was a bit nerve-wracking  since the animals are mainly nocturnal, the feeding had to take place after dark ... Watching the wallabies and possums come onto the lawn for food was a fun experience and we made it back through the forest and up to the house without too much trouble. Soon after that some possums came to our verandah and the kids got a kick out of putting food out for them and watching them eat. Then it was off to bed  another early night in anticipation of an early morning to search for platypus in the wild. The first place we visited was the pump house, located at the bottom of the hill in front of our house. But after about 10 minutes of waiting quietly we still hadn't seen anything, so we continued on to the next place  a path approaching the creek on the other side of the office. There we were thrilled to spot a platypus within minutes of arriving on the rocks! In all we saw 3 of them swimming quietly with the turtles, then it was time to return to the house for breakfast. The rest of the afternoon was spent visiting waterfalls, starting with the long walk down to the Dinner Falls, located alongside the Mt Hypipamee Crater. Our next stop was the waterfall circuit, including Millaa Millaa Falls and two others. We finally returned to the house late in the afternoon, and the kids headed off to try and spot some platypus in the creek again. I was left with just enough time to make the meat and potato pie for dinner (and told my pie was almost as good as the Australian ones). Once again we had evening visits from possums, who helped eat the leftover food from our dinner! After a long day driving around the tablelands, everyone was ready to turn in early. There was some talk of getting up early again in the hope of seeing a tree kangaroo, but when we woke up we could hear rain on the roof and opted to stay inside. When we looked out on our verandah, which is protected from the rain, the kids were excited to see that the parrots had returned and were eating from the birdfeeder. They discovered that if they walked out quietly with bird seed on their hand, they could coax a parrot to sit on them! Only after the parrots decided to fly away for good could I convince anyone to have breakfast. After that, we figured that we had time to make one outing, to Ravenshoe and the Millstream Falls before we needed to pack up for check out. Fortunately the rain had stopped and the sky was clearing up by the time we arrived there. We also opted for a scenic route on our return to the house, which took us past 2 additional waterfalls. We made it back to the house in time to empty our clean laundry from the dryer, make some sandwiches, clean up the kitchen and load up the car. With a flight departing at midnight from Cairns, and a noon check-out from the house in Tarzali, we were expecting a long day Wednesday. We stopped off at the Mungali Falls soon after we set off, which created a detour of about 45-minutes, but there really wasn't much else to do along the way and the rain had returned, so we arrived in Cairns at around 3:30pm with lots of time to kill. A visit to Woolworths to replenish the supply of grapes was in order, so we checked that off the list. Then we tried to find some shoes for Daniel and a pair of swim trunks for Ben, but no luck. Finally, we decided to check out the local playground along the esplanade, which was a big hit! The kids managed to entertain (and wear out) themselves for nearly 2 hours, after which it was time for some dinner. The pizza at the marina was the best we'd had in ages, and we all left feeling quite satisfied. Still, it was nearly another 4 hours until our departure! By the time we drove around to find somewhere to fill up with fuel and reached the airport, it was about 8:45pm and we were happy to unload the car and wait for the check-in desk to open at 9pm. Those last few hours until we were able to board the plane were rather painful, but once we were on board we could relax and spread out a bit, since there were plenty of extra seats. Even though it was a short night, I didn't feel too bad when we had to wake up and get off the plane. 25-Aug-09 :: It took most of Friday for us to recover from our painful journey back to Australia. But by late afternoon I felt sufficiently awake to drive to the supermarket and pick up some food for dinner. Shopping at Coles was pretty exciting after so many months, and everyone had fun preparing a meal for ourselves in the privacy of our own kitchen  there weren't even any complaints about cleaning up! During that first week of our "vacation from the vacation" or "holiday from the holiday", we developed a little routine. The kids were allowed to watch TV while eating breakfast, then they had to have 3 hours or so of quiet time to study, followed by lunch and another hour of studying. Then we would either walk to the beach, hit balls on the tennis court or swim in the pool until it was time to head off to the supermarket and plan dinner. And during the day, I took the opportunity to get as many servings of fresh fruit and vegetables into the kids as possible! The house was also equipped with a hot tub, where Daniel and I relaxed each evening. The other advantage of our time in Australia was that Daniel and I enjoyed the chance to drink reasonably priced wine again, and the kids were excited to be able to rent bicycles and ride them around the neighborhood. The girls both needed haircuts, so we checked that off the list. I jogged along the beach, which was very exhilarating, and Daniel devoted lots of time on-line to searching for furniture to order for the house in Vermont. I read a book which I'd borrowed from Virginia, and caught up on the laundry too, while Daniel spent some time on the tennis court with the kids during study breaks. The cooler temperatures proved energizing for all of us. I'd like to say that we did more in that first week, but it really was a time of rest and recovery. The TV was equipped with Austar, so the kids watched all their favorite shows on Nickelodeon and Disney Channel as well. And we just enjoyed eating simple meals, like tacos, risotto and meat pie! And we discussed our plans for the rest of the year. From Cairns we found a direct flight to Guam, so after checking that Peter and Joan (my friends who live there) would be around, we decided to stop there before heading for Japan, rather than between Japan and Hawaii. We agreed to go ahead with Ben's suggestion to visit the nearby islands of Yap and Palau as well, giving us nearly 2 weeks in Micronesia to look forward to. We also planned a weekend up in Cape Tribulation, which was a nice short drive. We left on Friday morning and headed north across the Daintree River car ferry. From there we stopped at the Cape Trib discovery centre, which was rather pricey for a quite ordinary attraction. From there we continued to a boardwalk, which was OK but not spectacular. Shortly after that we reached our hotel to get checked in and leave some time to visit the beach before dinner. After looking at the resident beach at the Cape Tribulation Resort and Spa, we chose to head up to the trademark Cape Trib beach instead, where the water was calmer due to the protection of the hilly peninsula which sticks out. After getting all sandy, we dragged the kids back to our cottages for showers and then headed off to Whet, a restaurant recommended on the Tripadvisor web-site. I can only say that the restaurant was fantastic  Daniel and I each had a perfect steak dinner, and the kids all enjoyed their meals as well. The food was simple but just perfectly prepared, which was a real treat! We loved it so much that we made a reservation for Saturday night as well. But in the morning we left our hotel after breakfast and drove up to the local campsite, where we were hoping to hire some kayaks for the morning. Unfortunately the seas were pretty rough and the guide was recommending that only experts go out. Ben was pretty disappointed, but agreed after having a look at the whitecaps for himself. So as an alternative, we headed next door to check out the Dubuji Boardwalk, which was amazing due to the fact that it took us through 3 different types of forest. The boys spotted a small, but very poisonous snake just off the side of the wooden path, which they photographed over and over again. We left there feeling quite pleased and then decided to drive up to Emmagen Creek, which marks the point after which only 4-wheel drive vehicles are recommended. The creek flows right across the road, so it was easy to find. The map showed a path to a swimming hole, but I couldn't figure out why the kids wanted to swim  the water was freezing and the air was not nearly hot enough to make anyone feel like swimming. Nevertheless, we followed the faint path (not really certain we'd gone the right way!) until we finally arrived at a point further up the creek where the water was pooled sufficiently to swim. The kids enjoyed moving rocks around to make a "dam" and entertained themselves for a good hour in the creek before we decided to return to the car and find some lunch. Walking along the path we had the most exciting surprise  a Cassowary crossed our path! We had seen some at the Australia Zoo last year, and probably at some of the other wildlife parks we visited when we were last in Australia, but we didn't really think we'd see one in the wild. In fact, it was an adult male Cassowary with a chick following, so we quietly followed the 2 of them at a distance for about 15 minutes, which was quite special. From there we stopped for lunch at the Beachfront Bistro and spent the remainder of the afternoon at the beach before returning to the cottages to clean up for another delicious meal at Whet. We arrived late, but just in time to stop them giving away our table  close call! Although the service on Saturday night was rather slower than the previous night, the food was just as wonderful. It was a pretty late night by the time we finished dessert, paid the bill and returned to the resort. Sunday morning we had booked a half day boat trip out to the Great Barrier Reef, but we were concerned that it might be cancelled since the seas had been pretty rough throughout the week. Still, we got everyone up early, packed and checked out of the hotel, and headed off to breakfast, waiting to see if the bus would come to collect us. We were pleasantly surprised when Jason pulled up right at 8:30am, but decided to drive our own car up to give us greater flexibility when the boat trip was finished. After renting wetsuits for everyone, we waded into the surf to board the speedboat. The 700 hp engines put space between us and the shore in no time, and 25 minutes later we pulled up to the Mackay sandbar. On the first snorkel I didn't see much in the way of fish, but the coral was very large scale, just as I remembered it from 17 years ago. On the second snorkel (still very nearby) we found a turtle shortly after entering the water and basically followed it around for the remainder of the time. The small group was a lot of fun and Jason and Travis were quite knowledgeable about the interaction between the reef and its creatures. It was a great outing, especially as the reef is so much closer to the mainland up there as compared with Cairns or Port Douglas. Though I wish we'd brought our towels out with us, since the ride back was absolutely freezing while wet! Click on any picture below to launch a gallery of pics from Far North Queensland. 25-Aug-09 :: Landing at Bali airport, once again, was a different experience in that little seaplane! The boys were very excited on approach to see a 747 waiting for its turn to take off ... After collecting our luggage, it was back to the InterContinental for a couple of nights. This time we upgraded to a couple of "Club Intercontinental" rooms, which made a surprisingly big difference. First of all, the room quality was noticeably better; and secondly we had access to a quiet room for breakfast! So we retrieved our stored luggage, settled into our rooms and cranked up the laptop to check e-mail  Daniel was hoping for a note from the British Consulate to say that they had his passport and he could come and pick it up any time. Well, no message from them that day, which was Tuesday. So Wednesday morning Daniel was on the phone with them and the news was not promising. Their records showed that the passport was still in Jakarta, at the Embassy, and had not yet been made! How annoying  having been warned that the time required was 10 to 15 working days, we had already waited nearly 3 full weeks. After a few conversations with the staff in Jakarta, it was finally decided that the passport would be completed on Thursday and sent via courier directly to the hotel (rather than to the Bali consulate). On that basis, we were still not prepared to book air tickets to Singapore on Friday evening though! Once we'd accepted that the passport was not ready and we were stuck in Bali at least until Saturday, we decided to get the kids set up doing some school work for a few days. Each morning after breakfast they worked for 3-4 hours, after which Daniel took the boys boogey boarding (best done at high tide) for a couple of hours; meanwhile, the girls had found the kids' club lots of fun and wanted to go there in the afternoons. I visited the gymnasium each afternoon or went for a jog on the resort grounds, and we all agreed that there were worse places where we could be stranded while waiting for a passport renewal! The passport finally reached us on Saturday at noon, which was just in time for us to depart for the airport and catch our 3:30pm flight to Singapore. Although we'd missed part of the weekend, at least we managed to be there Saturday night to see Virginia and Ava. After reaching the Hyatt and checking in, we quickly went back out to Newton Circus to meet them for dinner. It was about the most crowded, bustling place we'd been in ages! The kids had a great time wandering around the different food booths, finding things to try. The biggest hit was the fresh mango  we'd missed sweet mango while in Indonesia, and the kids gobbled up several as they were put on the table! Sunday morning we were very slow to get out of bed, and didn't finish breakfast until after 10:30am. Then we wandered over to Borders on Orchard Road, but were disappointed with the selection of books. We had a list of current books we were hoping to find, but none of them were available. After returning to the hotel to drop off a couple of purchases, we headed off to Virginia's house for a swim and an early dinner. The kids all had a great time in the pool together, then we wandered down to a local restaurant in her neighborhood for some Italian food. A taxi had us back at our hotel by 8:30pm and in bed early. Basically for the remaining 3 nights in Singapore we hung out in our hotel rooms during the day, with the kids catching up on school work, and met up with Virginia and Ava in the evenings. The kids all needed new pages added to their US passports, so I managed to fit in a visit to the Embassy, where I was told it was an overnight service. Now everyone has plenty of space for more stamps in their passports! We also managed a visit to the zoo on our final morning, which was pleasant. Singapore is a really nice city  much greener than other Asian cities  but some of the distances are rather far and something about riding in those taxis made me feel quite sick, so I didn't really feel like going very far. But we enjoyed walking around the Orchard Road shopping malls and managed to pick up a few essentials. We had been discussing our plans for August and trying to decide whether to carry on around mainland Malaysia and head to Borneo, or not. Although we were really excited about the sights and activities there, we came to the conclusion that we were just burnt out. If we couldn't face the fast-paced travel in the heat anymore, there is no way we could do justice to Borneo, in particular. Instead, we decided that we needed a break from Asia  the heat, the constant need to stay in hotels and eat out, and the crowds. So we booked a flight to Cairns and headed back to Queensland. The flight departed from Singapore at 10pm and, after a 3 hour stop in Darwin, arrived in Cairns at 8:30am, so we weren't expecting a fun night. By the time we landed, cleared immigration and quarantine (nothing to do with swine flu  just the regular Australian customs), collected our luggage, rented a car and drove up to our rental house in Port Douglas, we all wanted to pass out for a few hours, which is exactly what we did. Click on any picture below to launch a gallery of pics from Bali and Singapore. 20-Aug-09 :: This whole segment of the trip was pretty amazing, but in the interest of getting up-to-date I will have to keep my description brief. We returned to the domestic airport Bali after a night in the Inter-Continental at Jimbaran Bay. The flight to Labuan Bajo was delayed a bit, but we arrived at the tiny airport shortly after noon and waited with the other passengers for the bags to come into the building (not much of a terminal, really!) on a trolley. A couple of the crew members from Amanikan were waiting for us, and we piled into a couple of vehicles and headed for the pier. A short ride on the tender, and we boarded the boat which was our home for the next 5 nights. Soon we were underway, escaping the rather industrial surroundings of the town and heading for the pristine beauty of Komodo National Park. Not surprisingly, we visited one of the islands in the National Park to see the Komodo dragons. On Rinca, the ranger station is a bit less busy than on Komodo Island itself, so we walked around for about 1 1/2 hours and saw about 7 in all, including one absolutely monstrous fellow who was wandering the open space along the path from the dock to the ranger station! We were surprised how much hotter the temperature was on land, and very happy to get back on the water where the temperature was much more comfortable. And one of the evenings on board we were treated to a BBQ on a nearby beach, which was wonderful. The crew built a massive bonfire, which kept the kids entertained for hours  they kept running off to get more sticks and feed the fire. They served an overabundance of fresh seafood, which we could not finish, and an even better view of the stars compared to being on the boat. For the first 4 days the boat moved short distances within the national park, getting into position to be near the well-known dive sites. But on the final day we departed for a 20-hour passage going west past a couple of volcanoes, destined for Moyo Island and the Amanwana Resort. By that time, we'd completed 9 dives and seen the most beautiful coral, as well as a few reef sharks and turtles, but unfortunately no manta rays. Still, we dived many interesting sites and also did a bit of snorkeling. We also visited a few sandy beaches and collected garbage and shells. And the kids enjoyed fishing off the front of the boat, catching dinner one evening. With all the activity, I doubt we managed to stay awake later than 9pm on any of the nights! Reaching Moyo Island at 9am on Saturday was exciting, but the rooms were a bit disappointing. Having stayed in tents at the Aman resort in Ranthambore, we had pretty high expectations of a tented resort, but this one was nowhere near as nice. On the final morning the toilets in both our tents broke and we had to use the restaurant toilet! But in the meantime, we enjoyed the beach (although it was not sandy, but made up of hard, rocky coral) and the activities. Daniel and I had a massage to ease the aches of carrying our dive tanks for so many days. We took the kayaks out to the reef just off the beach and snorkeled, seeing sting rays, a small shark and even an octopus! Unfortunately, the snorkel equipment was not nearly as nice as the equipment on the boat was. Daniel and Felix also took the hobie cat out for a sail a couple of times  again, that experience was marred somewhat by the fact that one of the sails was torn and the resort had no replacement available. When it came time to leave Amanwana, we were excited to board the seaplane and head back to Bali! Click on any picture below to launch a gallery of pics from Borobudur and Komodo. 18-Aug-09 :: Just leaving for Guam tomorrow to visit an old friend of Monica's followed by a side trip to Yap and Palau in Micronesia where the diving is meant to be "out of this world". We plan to be in Japan on Sept. 2nd for 5 weeks. 18-Aug-09 :: Check back soon for a new Trip Log entry. In the meantime, please click on any picture below to launch a gallery of pics from Singapore. 15-Aug-09 :: An evening departure from Denpasar airport meant that we didn't have to leave Bukit Naga, the villa in Ubud, until 4:15pm. Check-in at the domestic airport was fairly straight-forward, though we had to go back outside the airport to find something to eat. It's a good thing we picked bought some nibbles, since Garuda Indonesia takes the award for "worst food" that we've so far encountered! By the time we landed and collected our luggage in Yogyakarta, it was already dark (even though we gained an hour between Bali and Java). The pick-up by Amanjiwo staff was very well organized, and after a pleasant hour chatting with the driver, Didit, about the local area, we reached the resort. Hoping to feel more energetic in the morning, we all headed to bed by 9pm. Next morning, we managed to get to breakfast at around 9am and got to planning out our day. Since the temple was so nearby, we all agreed that some of us would like to cycle there. Our departure was planned for 2:45pm  the boys and I would cycle, while Daniel and the girls would get a ride, and we would have a guided tour. But before that, we decided to relax around the pool for awhile and requested a pony ride for the girls. The horse (too big really to be called a pony!) was named Signor, and he was old and white. He usually pulls a carriage, so giving the girls a ride was an easy job for him. He was kept busy for about an hour in the gardens near the pool, while the rest of us swam, then ordered lunch by the pool as well. Soon it was time to head off, so the boys and I found our bicycles and rode off down the road. The way there is completely downhill, though not very steep, and we didn't even need to pedal once! On arrival we left the bikes, joined Daniel and the girls and met our guide, Nur. He led us up to the front of the ancient Buddhist temple, and explained the history to us. We climbed up the first flight of steep steps and turned to walk along the first level of the exterior, where carvings along the walkway tell the story of the Buddha's life. Above the tablets telling the story are many carved Buddha statues, but 120 of them are missing the head! Apparently they were given away as gifts by the Dutch government when they ruled Indonesia. So the photographers of our family were all on the lookout for intact statues, few and far between. When we reached the top, the clouds parted long enough to see 2 of the nearby volcanoes on Java, which was very exciting. By the time we cycled back to the resort it was nearly 5:30, but the kids really wanted to continue cycling in the car park for a bit longer. We soon returned to the room to get ready for dinner, which was served in the dining room. The view from the entrance encompasses Borobudur, as well as the three surrounding volcanoes, so it is quite spectacular! Then it was off to bed for an early night, in anticipation of our pre-dawn wake up. Promptly at 4:30am, we were awoken! Getting up in complete darkness is always a challenge, but I have to give the kids credit because they arose without any complaints and were up in the lobby, ready to go, by 4:45am, nibbling on muffins. We were met in the car park by Didit, again, and then it was off to Borobudur once more to climb to the top and watch the sun rise. With about 30 other people, we were perched on top of the temple, poised for the sun, which appeared between two of the volcanoes! In the process, it shone upon the third volcano, which ended up being the most photographed subject of the morning. Once the sun was visible, we began a slow descent from the top to the bottom of the temple, once again looking at the stories carved into the walls and the Buddhas sitting on the walls. We were back at the resort for breakfast by 7:30am, which we thoroughly enjoyed. Then we had about 20 minutes for the mad photographers to empty their cameras before we set of on our next outing. At 9am we took 3 bicycles and the rest of us drove with Didit down to the football field near Borobudur to meet Signor and the carriage. In convoy, we toured the countryside and experienced the local flavor. The first 2 stops involved the making of glass noodles  first we watched the ladies who take the wood from the tree and turn it into pulp, which was then sieved in a big pot. The big pieces that remained were squeezed into balls for the cows to eat, while the part with the liquid consistency was taken to our next stop. There we watched as they boiled the pulp and poured it onto trays to dry in the sunlight, then removed the final product (which resembled spaghetti!). I was told that rice is the everyday food, while the glass noodles are a bit more special, reserved for once a week or so. After that, we visited a tofu factory, which was very interesting. The beans were brought from another part of Java, and then put into a grinder (similar to grinding coffee beans!) and then boiled for an hour before being poured into a rectangular mold and left to dry. Once again we set off on the country roads, this time to watch pottery being made. First we encountered a village where a wedding had been set up across the main road so we had to dismount and walk through in order to reach the other side of the village. The boys found the pottery-making process quite fascinating, but once that demonstration was finished we were ready to finish. 11-Aug-09 :: Our welcome to Bali was the best yet  we were met by and immigration officer who took our arrival cards and passports, ushered us through the "crew" lane, and magically appeared with our visas in about 10 minutes! Meanwhile, we collected our luggage from the conveyor belt and were ready to leave. Smooth sailing! The first thing we noticed after exiting the airport was the temperature, which seemed cooler than what we've become accustomed to. From the airport we drove about 30 minutes to arrive at Gajah Putih, the fantastic villa we rented for 5 nights. We were thrilled to discover that the property was located on the beach! The villa also had large, flat-screened TVs in each room (ideal for watching those Wimbledon matches!) and a large swimming pool with a sauna, so relaxing was not at problem. We arrived on Sunday afternoon and chose rooms, then got settled in for a 5-night stay (unfortunately it was booked for a wedding after that). I had misread Nina's itinerary and thought they arrived on Monday evening, so after massages for me and Daniel, a visit to the shopping mall and a swim, the boys and I headed back to the airport. We waited and waited, but obviously they never arrived. I was quite worried, thinking that they'd missed their tight connection in Singapore, so we returned to the villa to have a look on the internet and see if there was a message from them. Finally, Daniel figured out that they were meant to arrive on Tuesday evening, so I could stop worrying and just feel like an idiot! So the next day I had another massage (I'd arranged for the masseuse to return for Nina and Gregg but didn't have time to cancel)  during the day we walked on the beach, swam in the pool and the girls played with the dogs  and finally set off for the airport once again. This time they made it! Although one of Nina's suitcases did not, so they were still among the last from their flight to leave the airport. When we reached the villa, the girls were asleep and the boys were exhausted so they quickly headed off to bed. I wasn't sure what time zone Nina, Gregg and Gunnar would be in, so I also got ready for bed. Nina managed to get Gunnar to sleep pretty quickly (sharing a room with the girls!) but she and Gregg were wide awake so Daniel grabbed a few beers and we all sat up talking until pretty late. Still, the next morning everyone was up at a decent hour and we all swam while Nina and Gregg had their massages. After that the boys were keen to hit the surf, which is pretty big, and Gregg agreed to fight the waves with them. The next couple of days passed very quickly, with walks on the beach, time in the swimming pool, watching tennis at night and eating! Miranda was keen to try the local horseback ride on the beach, and Daniel convinced Nina and Gregg to come along as well, so we watched them walk off down the beach on their horses. Gregg ended up with a pretty feisty one, and Miranda's horse was really more of a pony, but they all enjoyed themselves. The adults also managed one night out for dinner at Warisan, a local French restaurant with a shop selling Balinese art and fabrics. Daniel managed to purchase a few masks while we were waiting for our dinner to arrive. My pre-dinner margarita wasn't the best, but the steaks were surprisingly delicious and the atmosphere was lovely, though the restaurant is not on the beach. After dinner we headed to Kudeta, the trendy place to eat and drink. The layout and atmosphere reminded me a bit of Miami Beach and the Delano, but on a smaller scale. Friday morning we packed up and got ready to head to our next villa, Bukit Naga, located near Ubud. The cars arrived at about 11:30am and it took quite a long time to reach the villa (about 1 1/2 hours), during which we all started to feel a little ill! But everyone felt better upon arriving and having a look at the accommodation  the villa was on top of a hill, facing west, and overlooking beautiful terraced gardens, with views of the mountains in the distance. Perfect for watching the sunset! The next day we planned an outing to the nearby mountain, with views of Lake Batour, formed inside the crater of the old volcano. We also visited a temple on the top of the mountain, which is a rebuilt version of an old temple which was destroyed when the volcano erupted early in the 20th century. After that we stopped at the supermarket and returned to the villa for some more swimming, relaxing and dinner! On Sunday we also ventured out for a trek through the rice paddies just north of Ubud. What a gorgeous walk! The kids were enchanted by the multitude of ducks living in the paddies, and how they followed each other in lines along the mud walls separating the paddies from each other. Egrets and herons were also abundant, and we saw the odd water buffalo. After the long walk we were all hungry and stopped in a restaurant on Monkey Forest Road. After some window shopping we sent most everyone back to the villa, but Ben, Gregg and I continued on to see a water fall. At the entrance to the waterfall was a group of shops with fairly aggressive hawkers, which we didn't quite manage to avoid. Then we saw the falls, which were unexpectedly tall and beautiful, so we walked down the path to the bottom where Ben managed to get some good photos. Back at the villa, we managed to pass the remainder of our visit quite easily, with dips in the pool, reading in the outdoor pavilion and enjoying the view. We also had another massage each! Nina and Gregg had said that the weather in Chicago was not particularly summery so far, so hopefully they got a good dose of nice weather that week. On the Monday, Daniel went off to the UK Consulate to submit his passport application, which he was told would be sent to Jakarta and take 10 to 15 working days. Then he booked flights for us to Yogyakarta to continue our journey. Tuesday was the last day for Nina and Gregg, who had to catch a relatively early morning flight to Singapore, so much of the afternoon was spent packing up. But first, in the morning we headed off to the Bali Safari and Marine Park, where Gunnar had a chance to ride an elephant. The park was quite nice, with a variety of attractions, but we were just there for the elephants. The kids all got a bunch of carrots to feed to a mother and her baby, then Nina and Gunnar did their ride. And shortly after lunchtime we were back at the villa to relax once again. After a great visit with Nina, Gregg and Gunnar, we had our usual feeling of being let down. But Daniel and I had some shopping to keep us occupied, and we ended up buying a few sculptures, which were shipped back to Vermont. Click on any picture below to launch a gallery of pics from Bali. Check back often for an Archive of all Trip Log entries.